The area around Kerkplein has changed drastically of late. 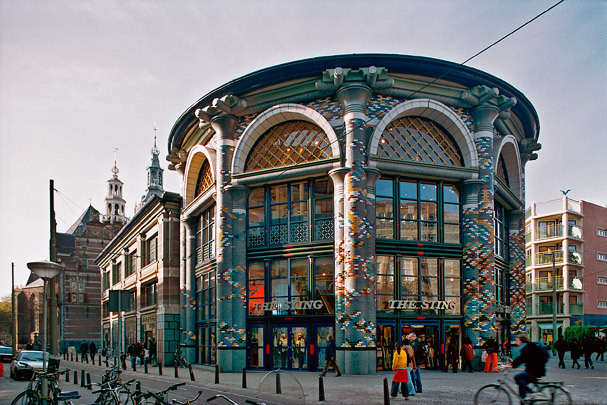 Piet Zanstra's modernist concrete annexe to the former town hall has made way for a colourfully tiled, cylindrical retail building by the English architect John Outram. Dubbed the 'candy box', it sports gigantic pillars with fantastic capitals and a dome with a leaded light. Another project by Zanstra, the Driehoekjes office building, has been stripped, partly demolished and transformed into housing by Vera Yanovshtchinsky. A long-vacant lot is now occupied by a housing block by Gunnar Daan.